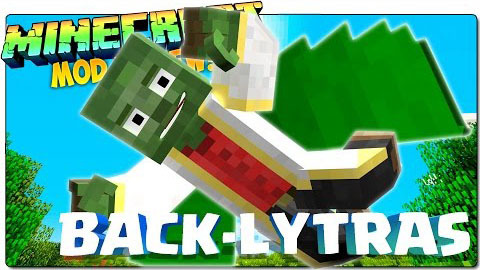 Backlytra Mod is an amazing Minecraft mod that backports Elytra from Minecraft 1.9.2 to Minecraft 1.8.9, 1.7.10, and 1.9. Supports vanilla resource packs to override texture and sound, works with capes, has Quark-style dyeing, everything. Craftable by default, can be configured. The 1.9 version only backports the sounds, if you want dyes and recipes see Craftable Elytra Mod and Quark Mod. The 1.7.10 version is something of a hack and may glitch frequently. It also doesn’t support non-default Elytra textures, from either capes or player info.